We have Jen Goode back again this month with a fun DIY pom pom garland that is perfect for March! Grab your yarn to get started! 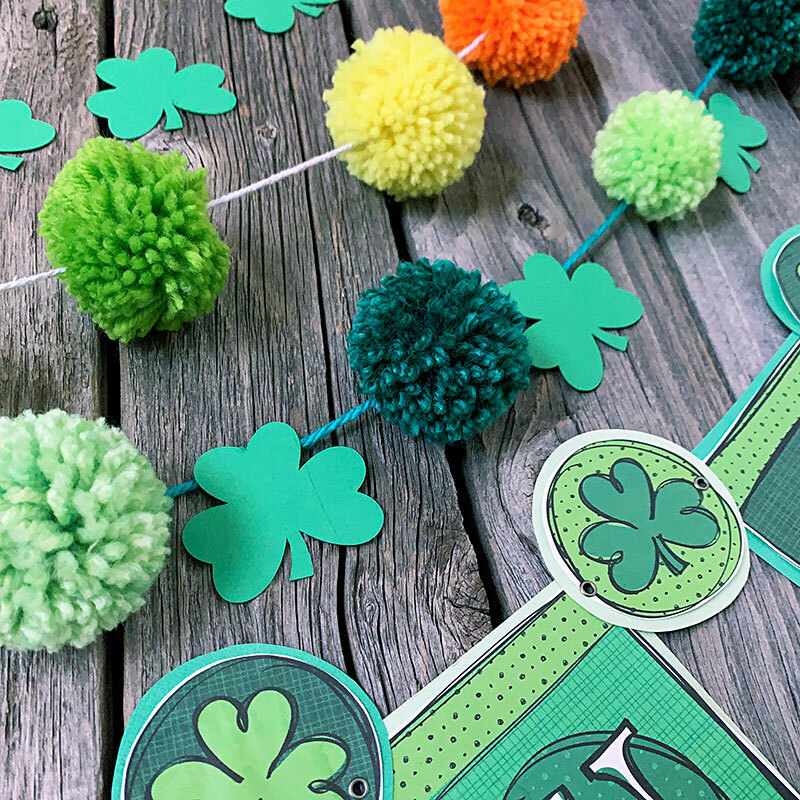 Today we’re grabbing some yarn to make a fun pom pom garland for Saint Patrick’s Day. I’ll show you how to make these classic yarn balls you can use to decorate. Choose a single green yarn, or get crafty with a rainbow of pom poms. Yarn pom poms are pretty simple to create. You can make a variety of sizes just by changing the size of your template. 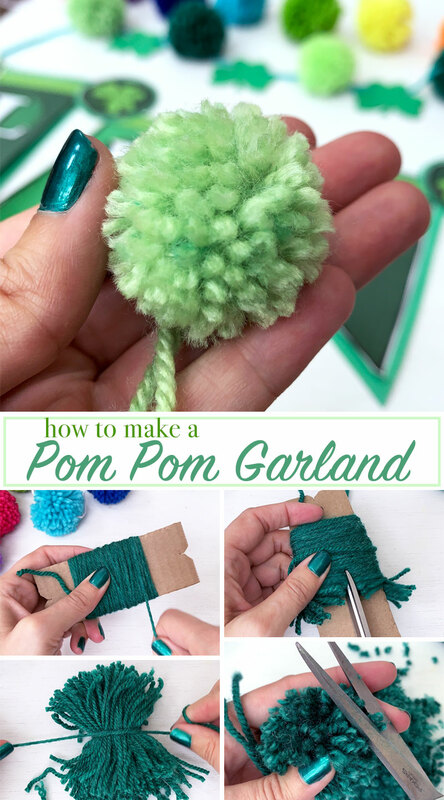 String the finished pom poms together for a fun garland. Add a little extra festive touch to your celebrations. You can use the pom pom garland you create as part of a decor display. Layer different garland together for different looks. I like mixing the yarn with cardstock cut outs for a fun design. You can use the alphabet printables to make a banner to go with your garland too. Cut a piece of cardboard about 1.5″ wide and 4″ long. This will be your pom pom template. Wrap yarn around the template as shown below. Cut the wrapped yarn and then tie the bundle, leaving a longer length of yarn. Using the scissors, trim the pom pom until its a dense ball of yarn. To create the garland, tie each pom pom to a string of yarn. 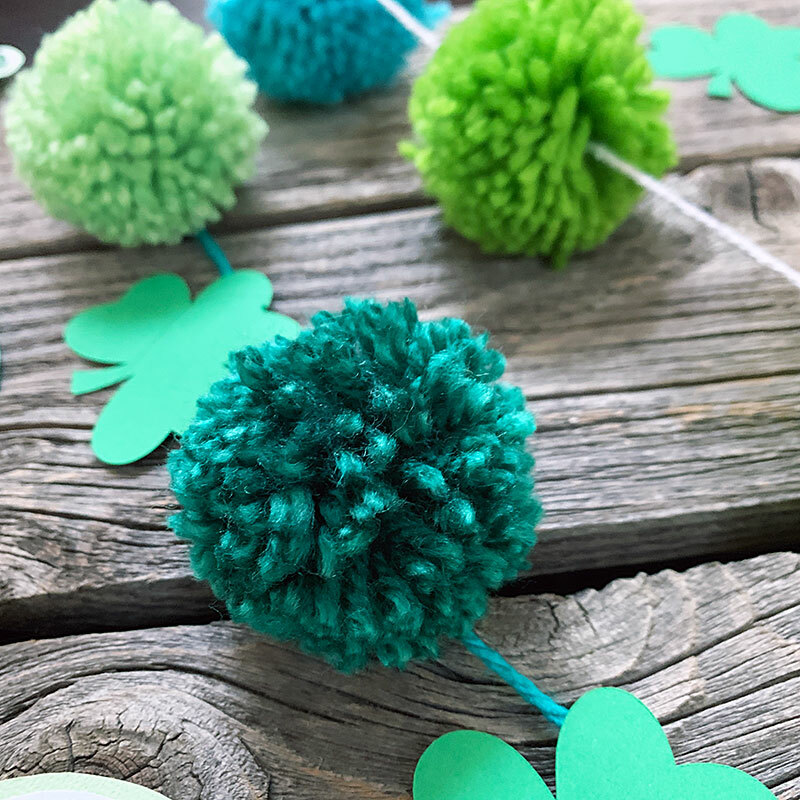 Cut shamrocks and glue in between each pom pom. 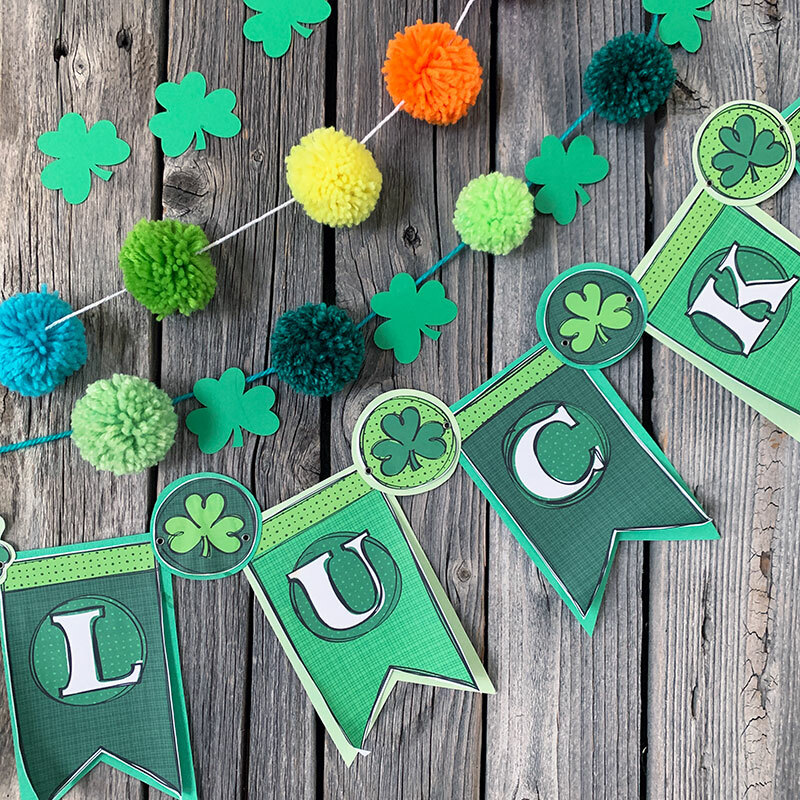 I hope you have fun making all kinds of pom poms to use for your St. Patrick’s day garland. 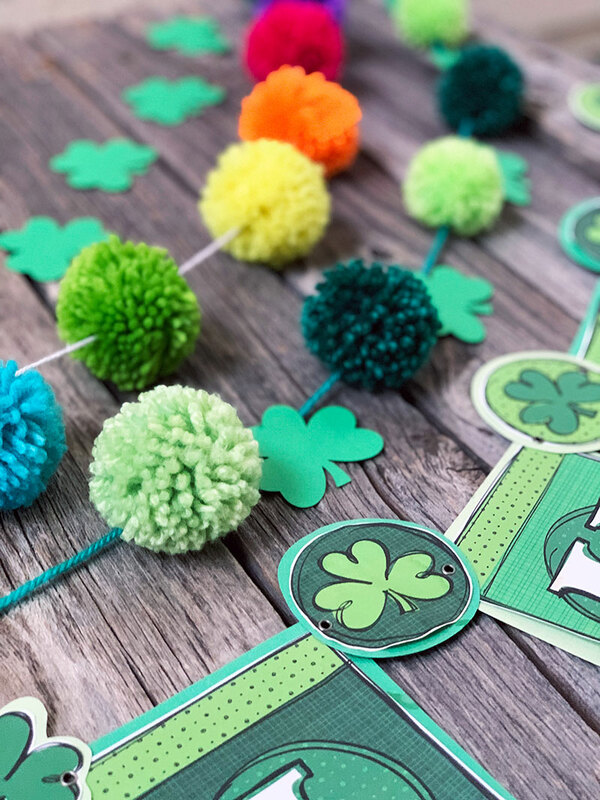 Here’s a little secret, I created all the green pom poms in my example, but I found the rainbow garland at the Dollar Spot at Target. Pom poms are pretty popular in the party sections these days, but they don’t always come in all the colors. So, making your own is a great way to add some extra fun to your party decor. Want another way to make pom poms? Learn how to use a pom pom maker in the video below! Love this DIY pom pom garland and want more ideas? Try the links below! I love the garland. I am wondering if you can string the pom poms together with a large needle and yarn? I am sure you can Stacy! I think this just makes it where there is space between them.